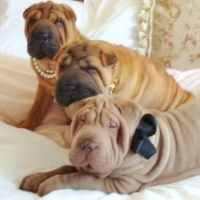 The miniature shar-pei should be 14" to 16" tall and weigh about 25-35 lbs. "My puppies are all wonderful. We enjoy them so much and spend a lot of time with them every day."